It is the late 15th century and a new age is dawning. While searching for a new trade route to India, explorers have discovered a new land. The first reports tell of strange creatures, exotic people, and fabulous wealth. Captains and adventurers flock to these new lands in search of gold. They are quickly followed by colonists, soldiers, merchants, and missionaries all seeking wealth of one kind or another. Colonies begin to spring up, and soon competition among the great nations of Europe begins. Take the role of one of Europe's colonial powers and stake your claim in the New World. As the leader of your nation, there are many paths that lead to victory: Discover and colonize new lands; acquire trade goods that will build your economy; develop new technologies and infrastructure in your home country; build your merchant fleet to dominate the trade routes; and build your army to defend what is rightfully yours! The triumphant revel in riches and glory, while the vanquished become a footnote in the history books. It is an Age of Discovery... it is an Age of Empires! This is the only game in my collection I rate a 10 on BGG. The combination of worker placement and area control along with great miniatures and an approachable ruleset make this one my group’s favorite. We regularly play with two adults and three teenagers, and while the adults win the lion’s share of the games due to superior planning, the kids make a game of it and win some as well. Cannot recommend highly enough. A fantastic game. I have played this game at least 50 times since I originally bought it in 2007. It’s a good turned-based strategy game that never turns out the same, even with the same players. My 8 year old can play it, but she can not ever seem to win, so it takes more than luck to really finish on top. So this may not be a family game with young children, but it’s mostly a game that provides a lot of entertainment between friends. I often find myself switching strategies mid-game as well based off of what I see other players are trying to do. If you play with more than 3 players, you’ll notice that if you are on top, people gun for you to try and knock you back, usually succeeding. 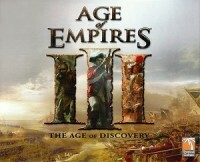 Add a Review for "Age of Empires III"